There is probably no icon more universally representing Japan than Mount Fuji. It is a dormant volcano 3,775 meters tall. It is only about 100 kilometers from Tokyo Disney Resort, which means it is potentially visible from the resort. I say "potentially" because on most days the haze in the Tokyo city air reduces visibility to a few kilomteres. (This haze is also the bane of photography-loving people like me, as many of my favorite outdoor photos are tainted by an unappealing flat white sky.) The best time to see Mount Fuji from Tokyo Disney Resort is in the cold, dry winter, although it is also sometimes visible during Fall and Spring during twilight hours; Mount Fuji lies west of Tokyo Disney Resort and the below-the-horizon sun acts as a backlight for the mountain. 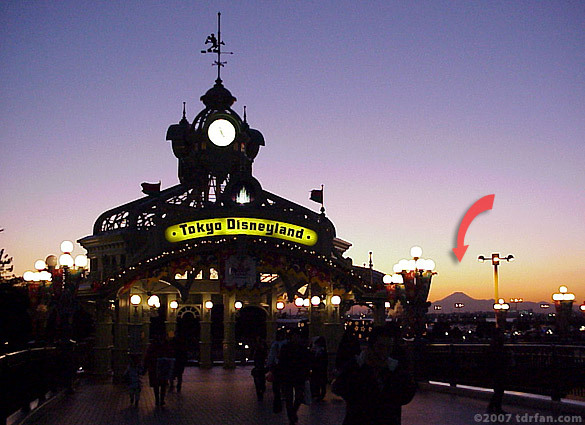 There are several locations to see Mount Fuji from Tokyo Disney Resort. For an unrestricted view, the best spot is the forward deck of the S. S. Columbia in DisneySea's American Waterfront. The other good location is the elevated walkway that goes from Maihama train station to the entrance to Tokyo Disneyland (although this view is restricted somewhat by the Resort Line Monorail station). If you were staying in one of the hotels around the Resort and had a room that faced west over Tokyo Bay, you should have a clear view of the mountain when it's visible.